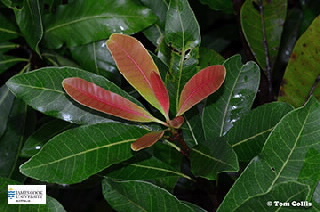 This tree, which is related to the mango has simple, alternate, elliptical to obovate leaves which tend to be clustered towards the ends of the branches. 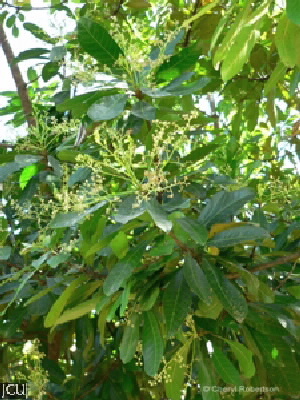 Flowers are in panicles towards the ends of the branches, petals 5-6, white to cream. Fruit black when ripe to 1 cm long. Resin present, when exposed to light as in a broken twig then it quickly goes black, may be an irritant in those susceptible.